About: Sanibel and Captiva - the best known and most often visited barrier islands on the southwest Florida coast - have not always been a part of the Florida landscape. Six thousand years ago, sediments emptied into the Gulf of Mexico by the Caloosahatchee River formed the two islands, which were once joined as one. Perhaps as recently as a thousand years ago a powerful sub-tropical storm swept the peninsula, opening a narrow pass between the islands. Blind Pass has disappeared and re-opened many times since with the passing of the centuries. People have lived on Sanibel and Captiva ever since the islands first formed. Drawn by the pristine environment and the remarkable supply of fish and shellfish produced by nearby estuaries, Archaic peoples and their Calusa Indian descendants inhabited more than fifteen major archaeological sites on the islands. The Calusa - a complex and powerful tribe who controlled all of south Florida - first encountered European explorers shortly after Columbus' arrival in the New World. In 1513, Juan Ponce de Leon made landfall nearby during his voyage of discovery. The discoverer of La Florida returned in 1521 to establish a settlement - perhaps on Sanibel, historians say - where he was attacked and killed by the warlike Calusa. By the early 1800's, Cuban fishing camps were well established in the rich, productive waters behind Captiva and Sanibel. Trout, mullet, drum and pompano were netted, salted and dried at fishing "ranchos" throughout Pine Island Sound and San Carlos Bay, then shipped by schooner to Havana and Key West. Euro-Americans who inhabited the islands before mid-century grew citrus and vegetables to supplement their diets of fresh local seafood. Shellfish were plentiful, just as in days past. Wild turkey, hogs, and sea turtles rounded out the early settlers' menus. Deer were so abundant that a haunch of dried venison could be bought for a quarter. Indian raids during Florida's Seminole Indian Wars made the remote tropical paradise of San Ybel unsafe for island inhabitants. Only during and after America's Civil War would increased military activity around San Carlos Bay make the area once again safe for settlers. 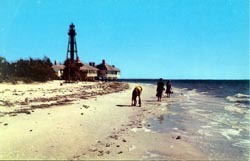 On August 20, 1884, the Sanibel lighthouse was first activated. Its kerosene lantern, later converted to gas, would serve as a landmark for ships passing the Sanibel and Captiva coastlines for almost a hundred years. 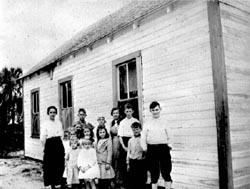 In 1892, with a permanent population nearing 100, Sanibel built its first schoolhouse. By the twentieth century, both Sanibel and Captiva supported flourishing farm communities. Avocado, melons, citrus, peppers, tomatoes and eggplant provided lucrative cash crops for farmers. Wood-burning steamers brought supplies, mail, freight and passengers to the islands. During historical times, six major hurricanes have struck the islands, the most notable in 1910 and 1926. Tides from the 1926 storm reached 14 feet. Angry floodwaters from the 1910 hurricane - the worst ever recorded in southwest Florida history - completely covered low-lying parts of both islands. Among Sanibel and Captiva residents, the conservation ethic has always been strong. All of Sanibel and parts of Captiva were declared a national wildlife refuge in 1945. Six thousand acres of sensitive upland and estuarine habitat on Sanibel are now held in the public trust by the J.N. "Ding" Darling National Wildlife Refuge. Thanks to a half-century of effort by dedicated island residents, more than 750,000 people now tour this world-acclaimed wildlife refuge and its interpretive facility each year.